I do like a nice, smooth promenade! 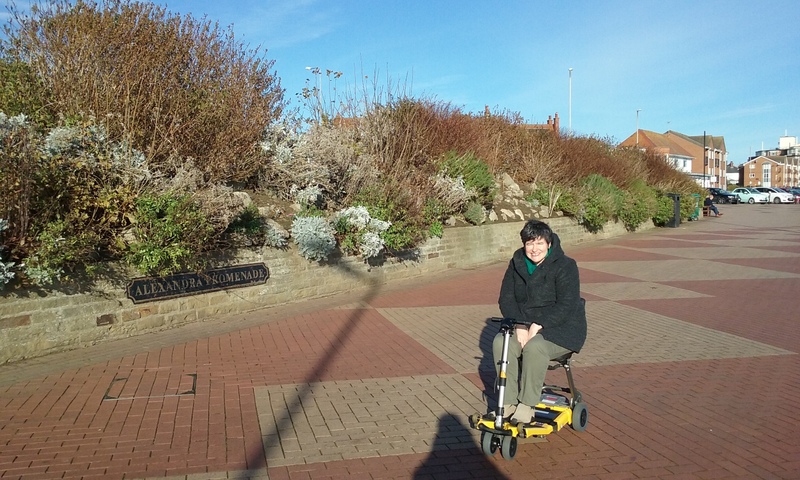 Bridlington has never been my favourite Yorkshire coast resort: Scarborough has more to do, Robin Hood’s Bay and Sandsend are more charming, Whitby is more dramatic, but Bridlington has what they don’t: a wonderful stretch of accessible promenade! 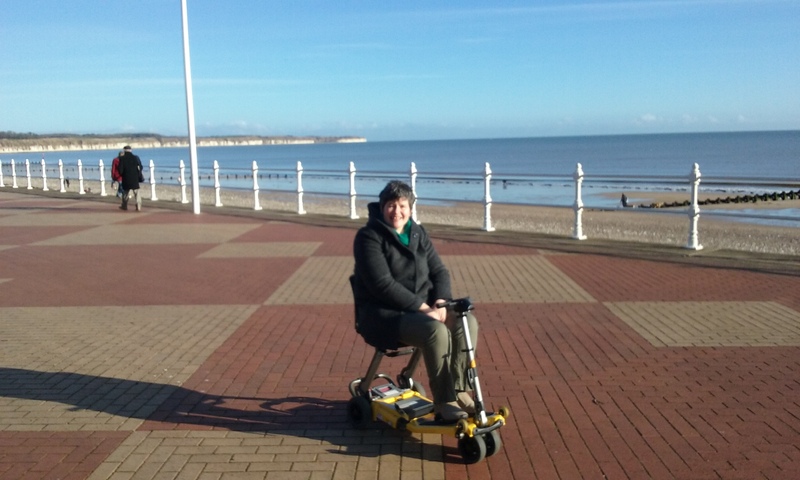 It was the most gloriously sunny day when we visited, though very chilly, and lots of people were enjoying it, including wheelchair users and a lady who came up and enquired about my Luggie scooter – I did such a great sales job, I should ask for commission! On the one side you could smell the seaweed while on the other there were shrubs and bushes so you felt well away from the road. There were some Blue Badge parking bays with smooth access to the prom, but they were all full so we used a nearby ordinary bay which just meant a slight ramp of an inch or two to get on the prom. There were other Blue Badge spaces in the carparks, but I guess in Summer it will be so much busier, I don’t know how easy it would be to get a space. There are Radar-key loos at intervals on the prom – didn’t use them so can’t comment, but the spa and no doubt the new leisure centre further along have accessible loos. As I mentioned in my previous blog about the place we stayed near Bridlington, as towns get done up, they become more accessible: it seems to be the way now to make the transitions between surfaces eg road and pavement, much smoother. This is a vast improvement, as jolting up or down a not-properly-dropped kerb is not pleasant. Bempton Cliffs nearby are also accessible – we decided to save that for warmer weather! 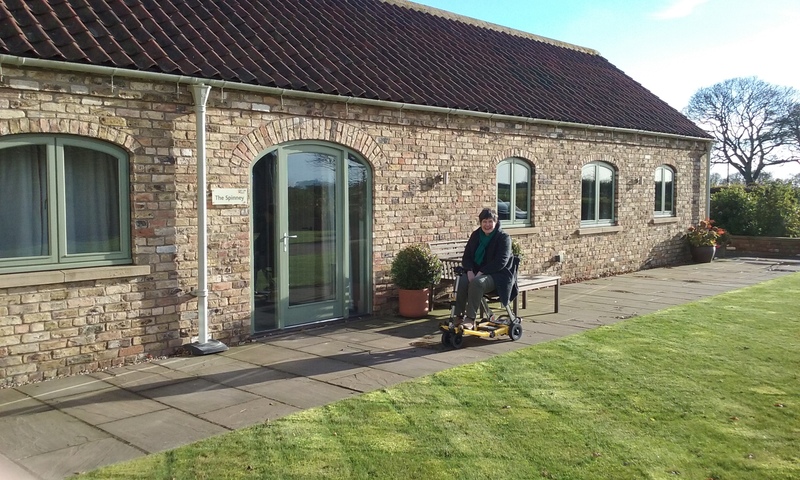 Eco-friendly cottages, accessible to all! Does it get any better? Yes, it does! The site is a haven for wildlife – there is a webcam linked to the tv to keep an eye on the resident barn owl, and many other species enjoy the peaceful surroundings. Plus there was a generous welcome basket of goodies from local suppliers including their home-produced organic apple juice – fabulous! The Spinney at High Barn Cottages in East Yorkshire is the cosiest, best-equipped cottage we have ever stayed in – so often cottages are cold on the first night, but with underfloor heating and a wood-burner (with generous supply of eco-friendly wood briquettes), we were toasty from the word go. with bathroom and a twin with ensuite wetroom. 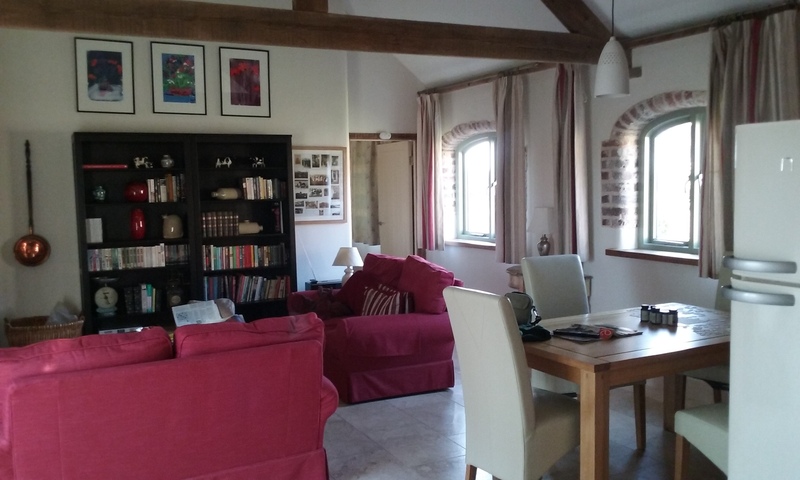 All the fixtures and fittings are of a really high standard and there are personal touches such as the history of the farm and the family, books, DVDs, games and tourist information. 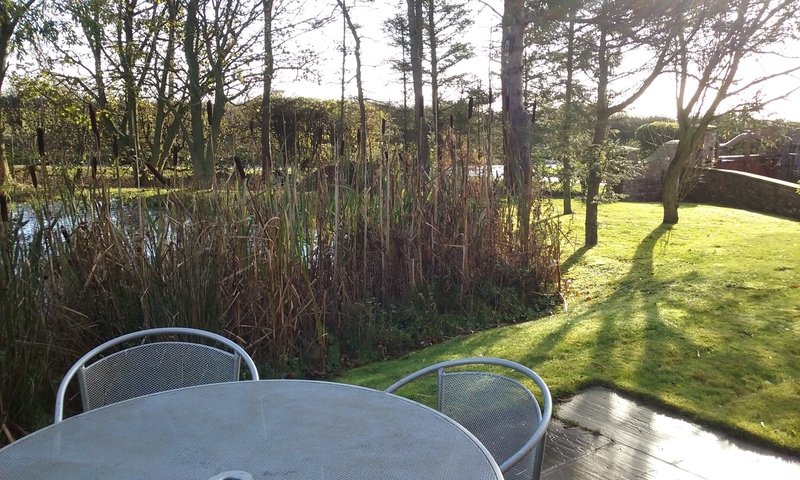 All have outside seating – ours had a table and chairs by a small pond – if it had been warmer we could have breakfasted outside! You can also sit in the courtyard so you can catch some sun – if there is any! – at all times of the day. My only issue (and having written a screed about it on the feedback form I was worried it would look like moaning, which was the last thing I wanted after we had enjoyed our stay so much, but Angela, one of the owners arrived as we left so we were able to discuss it with her and she agreed with us) was that a fixed overhead shower is a bit problematic if you don’t want to get your hair wet. That’s not really an accessibility issue, but that type of shower means someone else needs to run off the cold water you inevitably get before the hot comes through because you can’t avoid if you are seated – if they sorted that out and maybe added a couple more grabrails, we’d be back there like a shot! 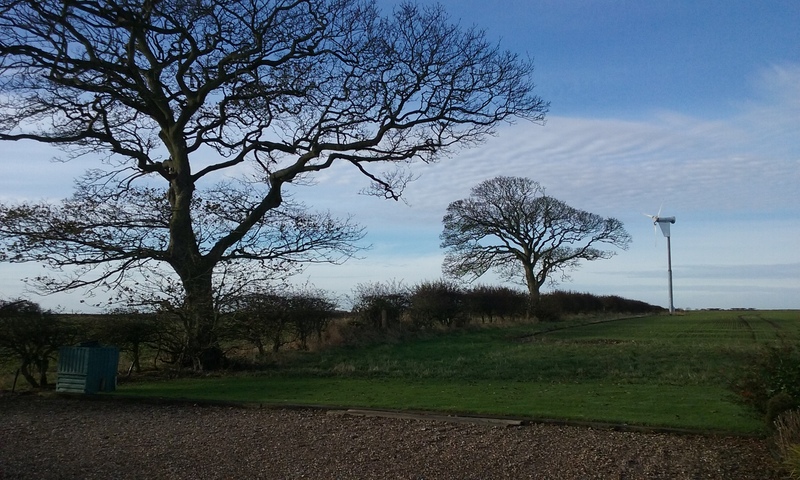 They have more cottages just down the road at Fieldhouse Farm, a couple of which are accessible too, plus two places in York. The journey there from York was lovely with all the Autumn colours and including a slight detour to take the Scenic Route while on the way back you get a stunning view of the Vale of York from the top of Garrowby Hill. Nearby you have plenty to do: Bridlington and the rest of the Yorkshire coast, Bempton cliffs, the North York Moors, places to eat out (there are recommendation in the visitor information folder in the cottage), and York itself is only an hour away. It was gloriously sunny on the Sunday morning of our long weekend so we went to Bridlington which has a very scooter-friendly and attractive pier at the North Bay. They seem to be in a process of making the town more accessible all round – actually, I get the impression that when towns do themselves up these days, they include accessibility in their plans – it was the same with Oban this Summer. About time too! 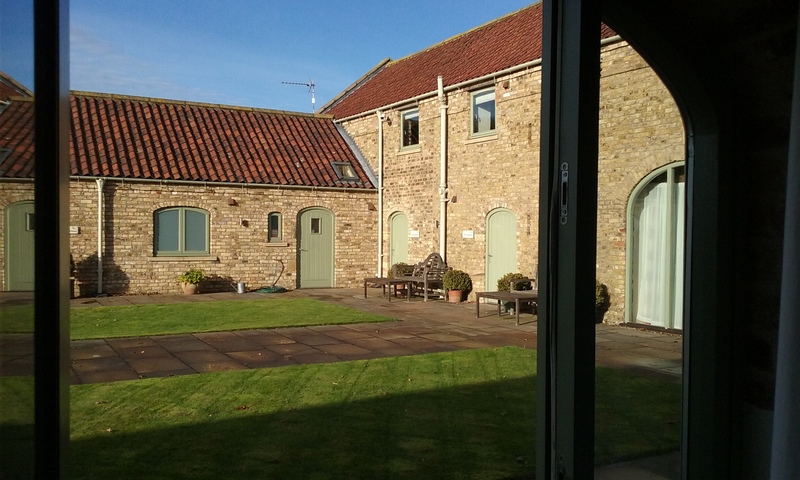 I actually found out about High Barn from the Premier Cottages site but booked directly with the owners who are happy to supply a shower stool or other extra bits of equipment on request. Have a look at their website – it gives so much information, including floor plans and access statements. It felt really life-affirming to stay somewhere so lovely and with such attention to detail – John, Angela and their family are obviously genuinely keen that you have a great experience and they should be really proud of what they have created. Here are some other accessible places we have stayed.